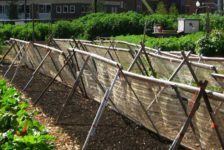 Article by Kamil Rawski – A Review of the Raised Gardens of Sants by COAC, in Barcelona, Spain. 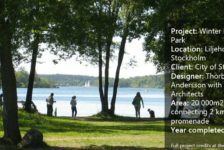 In the era of excessive urbanization it is increasingly difficult to find new spaces to make into green areas. At the same time the urban infrastructure absorbs more and more surfaces of the cities. What do you think, is it possible to find a compromise which is able to bring together these two aspects? This question was asked of the residents of Barcelona, and more specifically to those in the district of Sants. 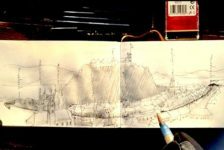 As necessity is the mother of invention, they managed to find a solution for the creation of a new park, and at the same time minimize the negative influence of the railways in the surrounding area. 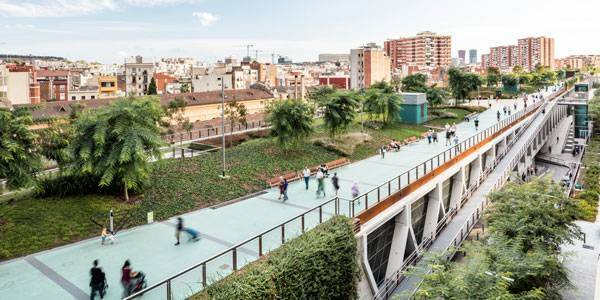 The Raised Gardens of Sants fulfils exactly this function, and can be successfully included into the relatively new trend of creating bigger and bigger urban green areas on flat roofs. But let’s start from the beginning. One of the first subway routes, opened in 1926, the L1 red line, together with the train tracks, split the Sants neighbourhood with an 800m-long and 30m-wide wound in urban fabric during the last century. 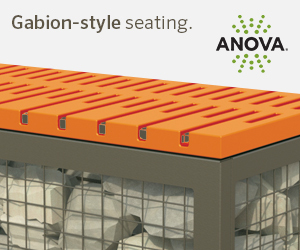 This barrier was also the cause of many urban dysfunctions such as excessive noise, pollution, and the degradation of the surrounding area. 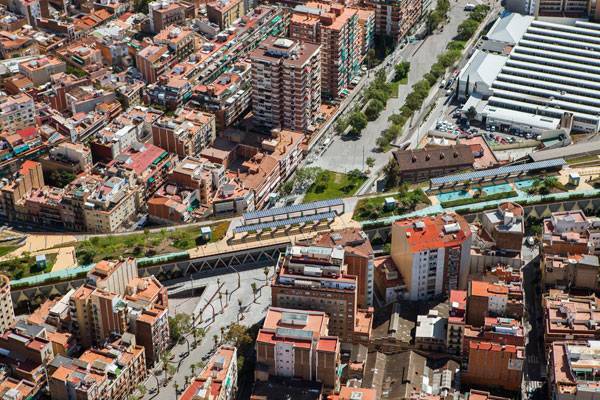 For this reason the city administration decided to begin a renewal project of Sants railway corridors. In 2002, the complex process was started that involved another three public administrations and the civic associations from this district in order to find the best solution of this issue. As a result of these works, they initially wanted to bury the infrastructure but due to economic and technical aspects, this concept was changed. 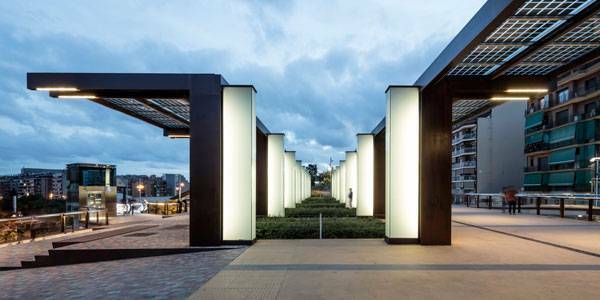 After much deliberation, the decision was made to cover the railways with a construction resembling a transparent box, and the whole idea was “simplified” to create the 800-meter garden on the roof of this structure. 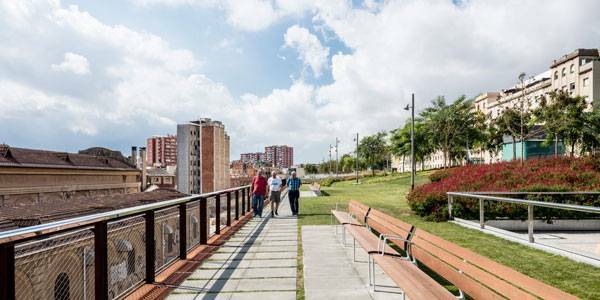 The thus-formed linear park could be extended in the future into the neighboring municipalities (Hospitalet, Esplugues and Cornella) to become a 5km-long green corridor. The supporting construction of the “box” is made of prefabricated concrete with diagonal beams which are – as the designers said – looking like the Warren beams, that evokes the old railway bridges, allowing the vision of the train passing through the city, minimizing its acoustic impact. But not the whole building is transparent. 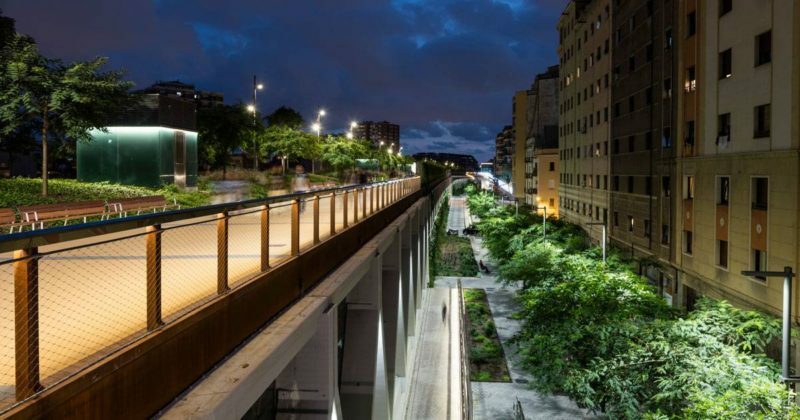 In places where it is not, three great earth slopes were designed and they support pedestrian ramps, which allow the passage between a large difference in levels from the street to top of the deck. Earth masses also make the longitudinal structure seem to be better-attached to the ground. 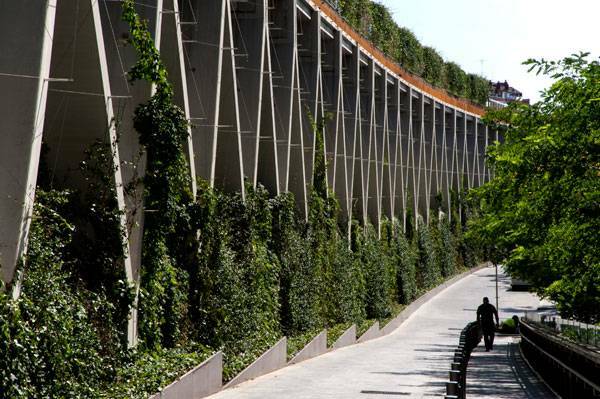 In addition, climbing plants growing on the walls gives the impression that the vegetation is spreading from the park into the city. The roof is situated at heights of 4-12m, and the height varies depending on the streets surrounding the building. As the result, the park becomes a panoramic viewpoint. 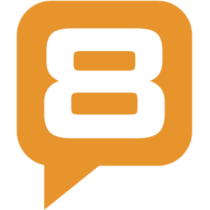 Designed linearly, two main paths define its axis. The one on the north side, for the most part, is shaded by trees. For people who definitely prefer the sun, there is another dedicated path on the south side. The space between them is designed as the backbone of the gardens based on a complex artificial topography. Growing there are rows of trees surrounded by plenty of densely-planted shrubs and upland vegetation. 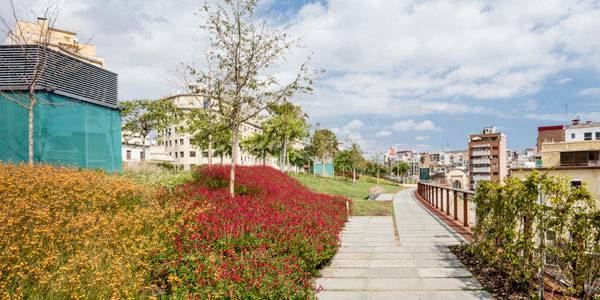 Landform features with properly planned vegetation generates scenery in which people can lose the sensation of being inside the city and feel like they are immersed in a natural environment. Along the main paths there are three places, which were mentioned earlier. They are the main entrances, which also contain five lifts and two adapted ramps, three stairs, and four escalators. It is worth it to note that thanks to these elements this park is more accessible for people with disabilities. 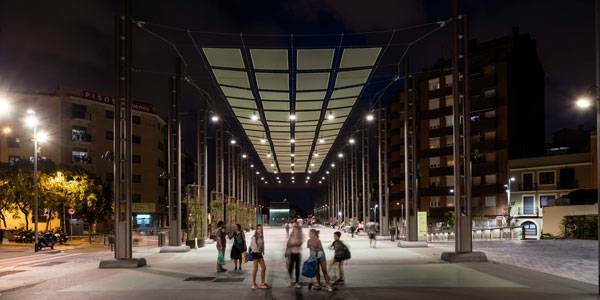 In the places of these joints, there are interrupted sequences of plants and instead there were designed big pergolas, which are covered with photovoltaic panels. 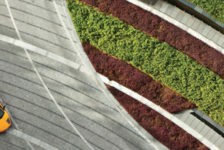 They are able to generate part of the green roof’s energy demand. The whole is complemented by the numerous places to sit. Urban furniture in the Raised Gardens of Sants was designed by Santa & Cole – a firm with years of experience in what makes the furniture more adapted to meet the needs of users and stylistically matching to the rest of the design. The plantings have been selected by a specific colour palette; the shades of white, yellow and red prevail, which may be related to Barcelona’s flag colours. The most-used species of trees are Koeleuterias, Sophoras, Tipuanas and Malus evereste, characterised by yellow and white flowering. In terms of groundcover and shrubs, the greenery has been divided into lawns and areas of flowering plants, with red salvia and wild roses in the sunny part offering a flowering of bright and warm colours. Meanwhile, on the shady part, mostly Hedera helix (English ivy), gaura, vinca and white lantana are growing. 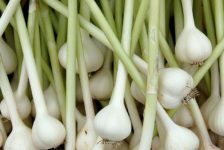 These are located on the north side and create a dark green background for the route, together with the nearest white flowers. Along the facade of a box-shaped structure, in addition to the usual planting, there was also a system of cables designed along the wall, so that climbing plants could quickly cover its face, skipping the transparent areas. Among these plants there are Hedera helix, Parthenocissus tricuspidata (Boston ivy), and Jasminoides. 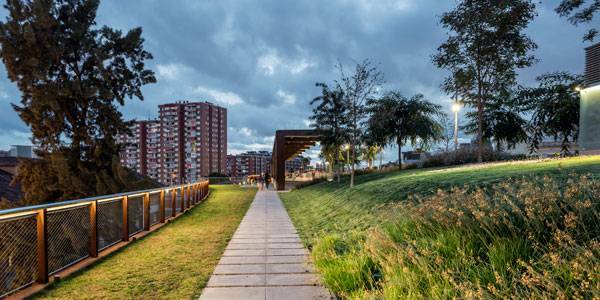 Projects like the Raised Gardens of Sants are implemented thanks to a social conscience. 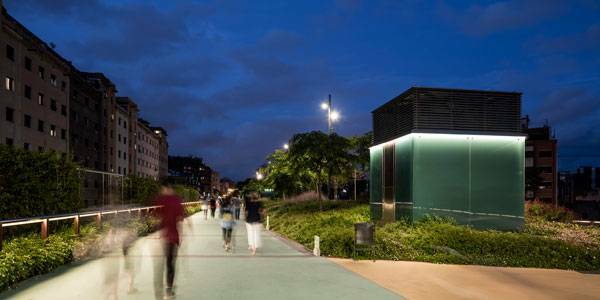 Rambla de Sants is a perfect example of how a new trend in the design proposes a new urban space to improve the life quality of citizens and to make city more ecological. 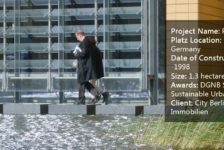 It is also a proof that the lack of space does not have to be an obstacle for designing additional green areas into the urban fabric. 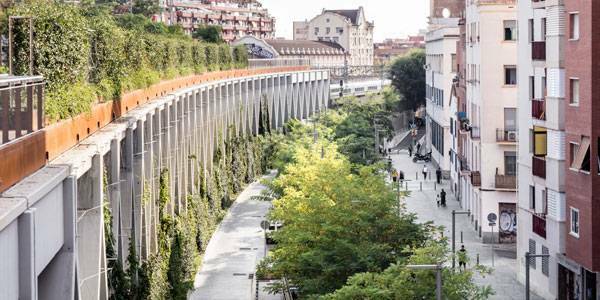 Certainly this is not the last green corridor to be built in Barcelona. What other places, in your opinion, could be transformed in this way?